Owl Aboard! Get down to business on Saturday, June 23 and Saturday, August 18! 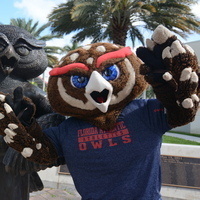 Your FAU community is here to serve YOU in order for you to start your semester strong. Visit offices and get situated for success from 11 a.m. to 3 p.m. Offices such as the FAU Career Center, Financial Aid, Admissions, University Advising Services, Global Engagement Center, the Student Union, Military and Veterans Success Center, Office of Diversity and Multicultural Affairs, Student Involvement, Student Health Services, and more will be there to support you.